An article in Friday’s New York Times about New York City’s fiscal crisis, “When New York teetered on the brink of bankruptcy”, brought to mind the fiscal crisis as experienced by Executive Vice-President Sanford Solender at Federation (highlighted in a previous post) in the mid-1970s. The current article mentions Richard Ravitch, and how instrumental he was in hosting a meeting between Governor Hugh L. Carey; Albert Shanker, the leader of the powerful teachers’ union; former Mayor Robert F. Wagner and others. Ravitch was involved when appointed by the Governor to “rescue the state’s overextended Urban Development Corporation“. Our interest in Ravitch is because his name appears in the Joint Campaign (UFJC) subgroup files in connection with a 1979 report he wrote with Sanford Solender after a trip to Israel, scouting new projects to fund as part of the United Israel Appeal’s “Project Renewal” campaign. Most recently I have been processing the files of Henry C. Bernstein and have found one box (so far) of UFJC files of potential Project Renewal projects of interest to the Joint Campaign fundraisers like Bernstein. Under the Project Renewal umbrella, UJA-Federation of New York committed to find donors for specific projects within specific Israeli towns. The same Ravitch/Solender report is again mentioned in Bernstein’s files. The hard copy of the report itself can be found within Solender’s UFJC files and will be available for research by the end of this project in 2015. While at work processing the Ernest W. Michel papers series, I happened upon this black permanent marker inside one of the cartons. Based on some UJA-Fed administrative records, I knew this series of boxes had all been packed up and sent to storage in the late 1980s or early 1990s. Based on box lists found in these cartons, I also knew that archivist / records manager Colonel Seymour J. Pomrenze and his team had been the people responsible for sending this material to storage for UJA-Fed. “The Colonel” as he was affectionately known, is famous in Jewish Archival circles for his prolific archives and records management consulting work at various Jewish non-profit organizations in the United States from the 1970s through the early 2000s. 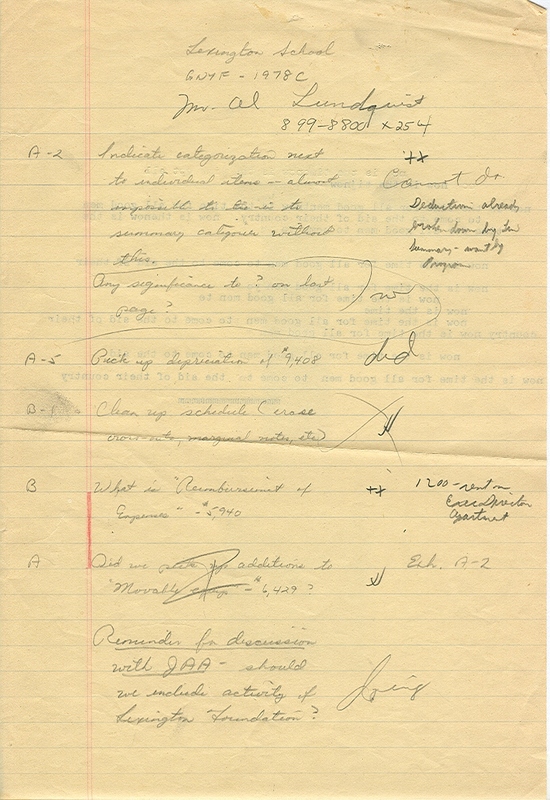 AJHS actually holds the personal papers of Seymour Pomrenze in its archives. The finding aid for the Pomrenze papers is very informative about the Colonel’s interesting life. As a young man in 1939, Pomrenze happened to take a job at the National Archives in Washington D.C. A few years later, after joining the army to fight in WWII, Pomrenze remained in the army and was sent with a team to Europe to recover library, archival and art materials looted by the Nazis. The Monuments Men, written in 2009 by Robert Edsel, tells the story of this team. There is currently a major motion picture on the Monuments Men in the works, as well, in which George Clooney is both director and star in the role of Pomrenze’s colleague, George Stout. The Monuments Men Foundation website has much more information on this. The Colonel served in the army until the 1970s, when he began consulting for UJA-Fed, the American Jewish Committee, FEGS (Federation Employment and Guidance Service) and other Jewish agencies. The consulting phase of his career lasted until the early 2000s, when the Colonel was in his late 80s. He died in 2011 and AJHS recognized him posthumously with a Legacy Award earlier this year. The marker, which is about twenty years old, wrote just as if it were brand new the recent day I discovered it. Its ink color and line quality seem to mirror closely the writing in the Colonel’s hand on the outside of the carton it was found in, leading me to conclude this marker had once belonged to Colonel Seymour Pomrenze. 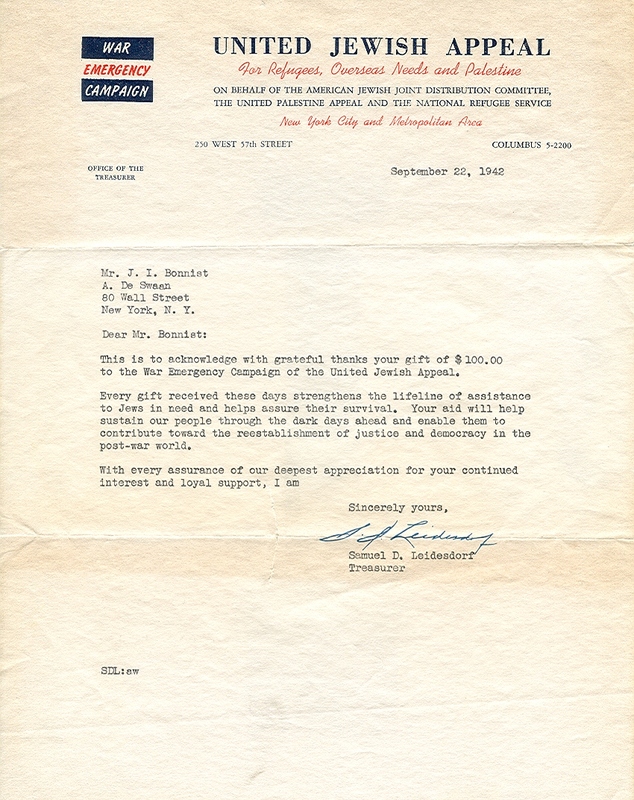 We received a donation of a few documents recently, from Carla Schein, the granddaughter of a very early donor to UJA’s New York office. Carla and I e-mailed a few times, revealing an unusual immigrant story with some unexpected role reversals. 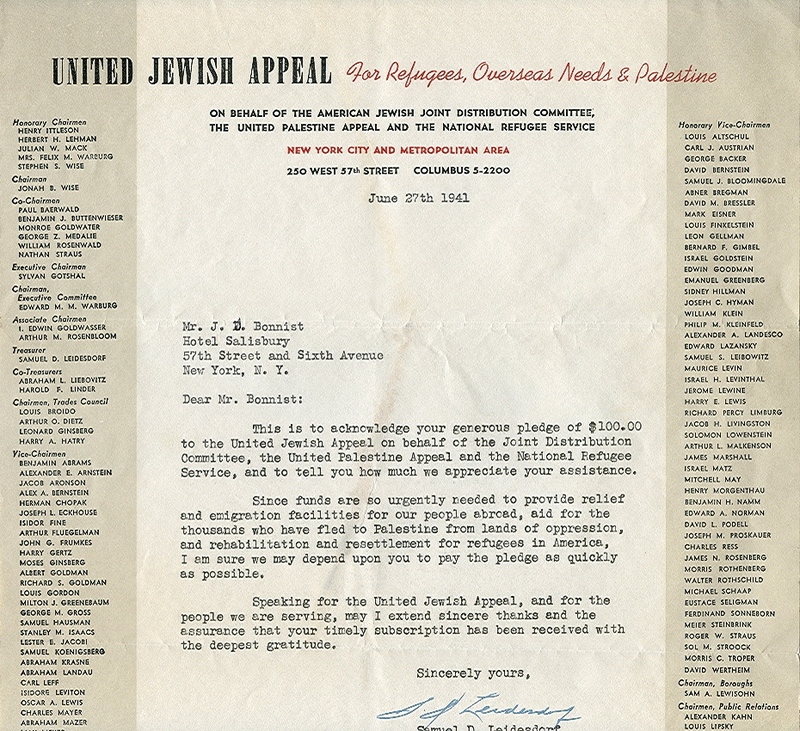 United Jewish Appeal (UJA) was created in 1939 by United Palestine Appeal (later, United Israel Appeal) and the Joint Distribution Committee (JDC) (and later, the National Refugee Service) to address the worsening situation for European Jews by coordinating fund-raising campaigns in the United States on their behalf. 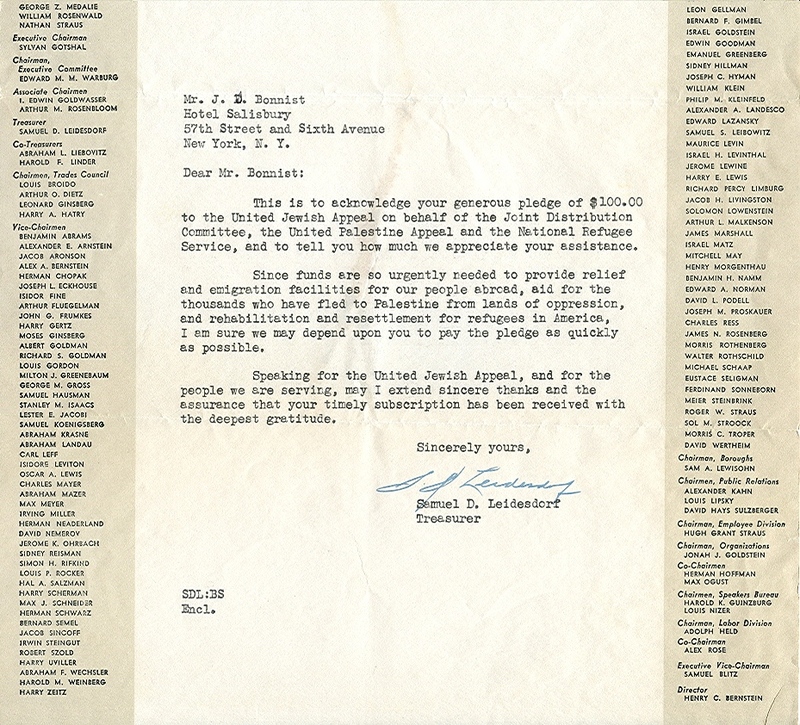 A mere 2 years after the formation of UJA, as we learned from the donated correspondence, Jacob Bonnist pledged $100. Most of the posts to this blog over the last year and a half have dealt with Federation, not UJA, material. This is because so few records survived as part of the UJA-Federation of New York archives collection. That is why we were immediately interested in this donation of a few documents. 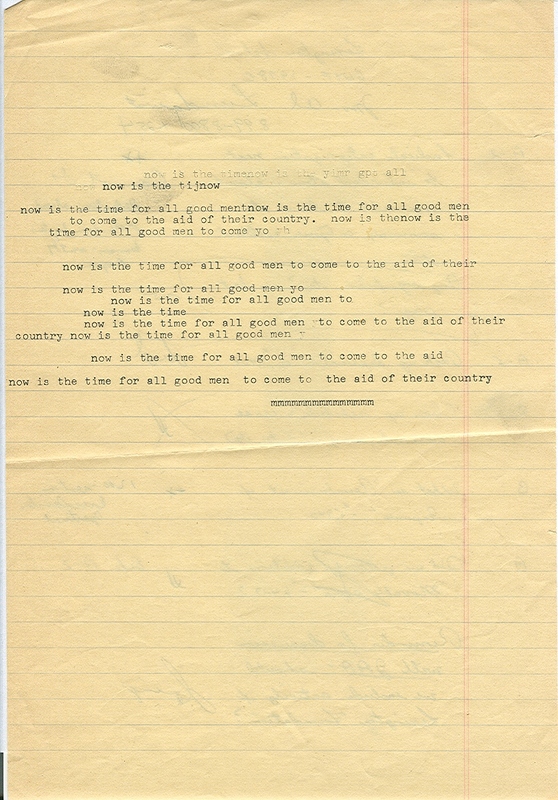 Just the long list of names on the letterhead in 1941 are of great interest – many of the names are familiar to us from Federation’s archives, and many may be familiar to you because of their involvement in many other aspects of New York City Jewish communal life in the middle of the 20th century. Mr. Bonnist’s story has only enhanced the research value of these papers. Thanks very much to Carla Schein and her family for this donation to the archives. The Federation of Jewish Philanthropies maintained a financial relationship with the Greater New York Fund (GNYF) for many decades, with budget files in the collection beginning in 1941 and continuing up to the fiscal year of the merger with UJA. Information in the files as well as online sources reveal a fund that predated both FJP and GNYF, the United Hospital Fund (UHF). Every year, FJP and each of its agencies applied to the GNYF for funding in a lengthy and laborious procedure. These agency files form a large part of the GNYF subseries within the Budget Department files. In 1947 FJP received $85,305, according to the GNYF annual report for that year; in the 1950s about 40 Federation agencies applied for GNYF funding, including Louise Wise Services, Altro Health and Rehabilitation Services, Hebrew Home for the Aged and Camp Louemma. Today UHF is a funded agency of the GNYF (United Way). We have retained these files because of the extraordinary level of detail about agency budgets. In future blog posts we will explore some of this detail and how important this 8% funding was to hospitals and other agencies.